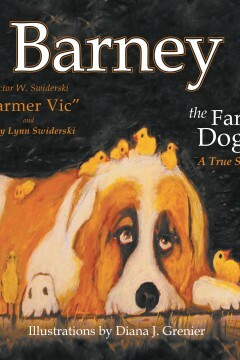 Barney the Farm Dog is a true story about a Saint Bernard. Read about this dog’s life on the Brewer farm with Farmer Vic. Barney’s funny antics and protective nature are heartwarming and humorous. All the illustrations are true pictures of life on the farm. Mary Lynn Swiderski has worked with children for twenty-five years as a 4-H educator and health and nutrition educator with Michigan State University Extension. She retired in June, 2014. She has degrees in journalism and family life education. She has always loved creative writing, poetry, books, and music. This is her first children’s book as told to her by her husband, Victor, prior to his death. She was born, raised, and continues to live in Saint Ignace, a small, quaint city located just north of the historic Mackinac Bridge in the Upper Peninsula of Michigan. Victor Swiderski was born and grew up in Detroit then moved to Brewer Farms in Leonard, MI after high school. His degrees were in Physiology and Animal Husbandry. Later he moved to Alpena and began Gamble’s hardware store, which later became a John Deere dealership. He sold the business to his partner in 2000. Victor married Mary Lynn in 2002 and moved to St. Ignace, MI. There he ran a successful antique business until his death in 2014.